It is really quite an honor for West Palm Beach to be recognized for our climate protection efforts in the large city category, sharing the Honorable Mention Award with the likes of New York City, Phoenix and Minneapolis. Steve Benjamin, Mayor of @CityofColumbia, SC & President of @usmayors, Jeri Muoio, City of West Palm Beach Mayor, Tom Cochran, CEO and Executive Director of the United States Conference of Mayors., Photo via the City of West Palm Beach. 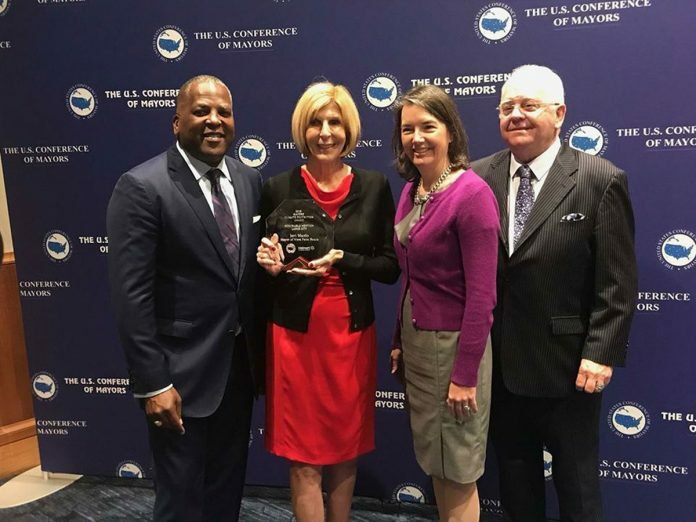 Mayors of Austin, TX and Schenectady, NY also took home top honors.